I have been looking forward to giving a squash pie a try for a while. 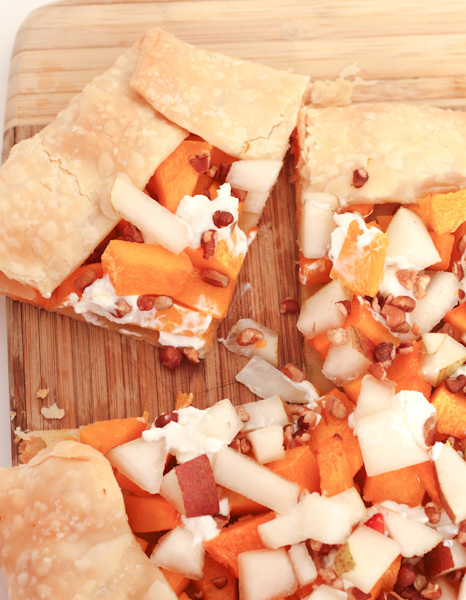 I love butternut squash and thought this would be absolutely divine. This recipe was inspired by one I read at Cinnamon Spice And Everything Nice. I didn’t have all the ingredients that were required for the original recipe so I improvised and made my own version. I really, really thought I had dried cherries in the house which is what I wanted to use on top of my pie, but no amount of digging through the pantry yielded those tasty treats. Instead I chopped up half of a pear and topped that pie with that instead. 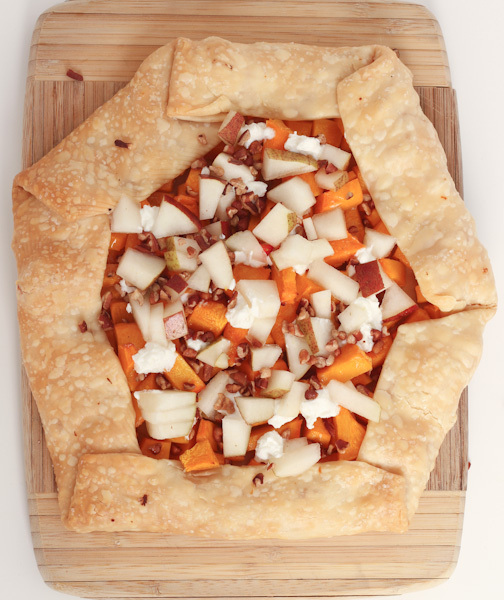 The addition of goat cheese and toasted pecans was very tasty on this pie. 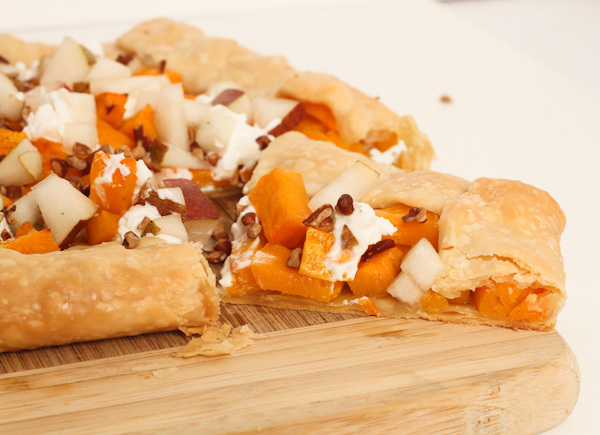 Oh, and I’m not ashamed to admit that I purchased a Pillsbury pie crust to make this recipe. 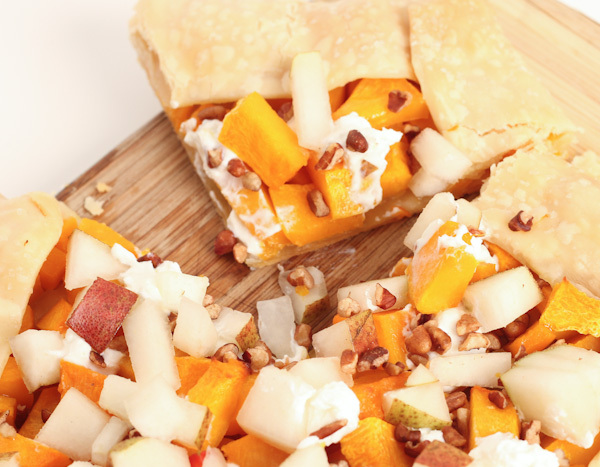 It is so much easier and faster to use a pre-made pie crust instead of making it from scratch. Yes, pie crust from scratch is nice, but I’ve kind of admitted defeat when it comes to making great pie crust. My grandmother and mom can rock out pie crust, me, not so much. Press the pie crust out a bit so that you end up with a 10-12 inch circle. Place it on a baking sheet lined with parchment paper. Place the olive oil and garlic in a small saucepan and simmer for 5 minutes. Season with a bit of salt and pepper. Do not let the garlic brown, turn down if that starts to happen. This will create a tasty garlic flavored olive oil. Yum! Pour half of the olive oil over the squash. Using a pastry brush, brush the crust edges with oil as well. Bake approximately 30 minutes until the pie is golden on the edges. 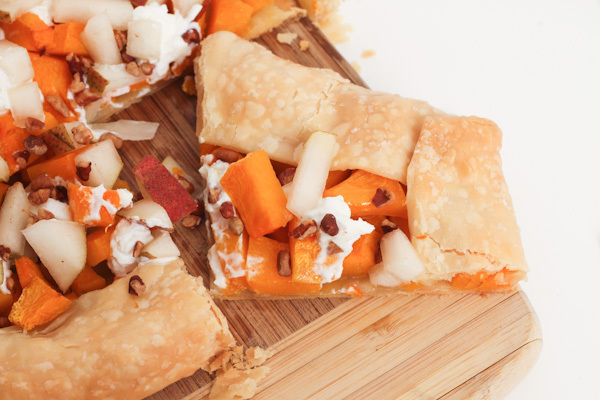 Remove from oven and top with goat cheese, toasted pecans and dried fruit or pears. If you like, bake an additional 5-10 minutes to heat cheese and fruit. Drizzle with the rest of the garlic oil. NOTE: In step 7, drizzle withÂ balsamicÂ vinegar instead of the remaining olive oil for a delicious twist on this dish. More recipes you might enjoy! Deb lives in Michigan with her husband and a very spoiled Maltipoo. She is an avid road-tripper who always searches out the quirky, weird and haunted when she travels. At home, she is a wanna-be Joanna Gaines designer and shares tips and tricks for updating and surviving life in a small house. In her spare time, she creates and shares simple, yet delicious meals and cocktail recipes. Read more about her here. Copyright ©2019, Just Short of Crazy. All Rights Reserved.